Follow the countdown on www.legoland.com. LEGOLAND Florida is set to open the gates to 150 acres of building block fun Saturday, October 15. Building block enthusiasts have been gifted with a 150-acre playground; 50 million LEGO bricks to satisfy the wonder of the building system that has captivated children for more than 50 years. On Saturday, October 15, LEGOLAND will open its gates to anticipating Floridians. The interactive theme park has more than 50 rides, shows and attractions, including MIniland USA, with a specialty themed Florida area. The largest in the country and one of only five in the world, LEGOLAND Florida will not only provide families and their children ages 2-12 with thrill-seeking, imaginative and interactive fun but also a hands-on education. Seven extracurricular educational programs for students in kindergarten-sixth grade give Florida teachers a chance to bring the classroom to the theme park. “By showcasing math and science in a fun and interactive way . . . we are aiming to change the way our students view these sometimes difficult subjects,” explained Kim Isemann, director of sales and marketing. Active Florida teachers are awarded a free annual pass, a $129 value. The seven programs are seasonally priced at $5 per students, accommodate a maximum of 15 kids and include a 45-minute educational session along with the full day at the park. Teachers can visit http://florida.legoland.com/freeteacherpass to register for the pass. One-day admission is $65 for adults, $55 for kids 3-12 years old. The standard annual pass includes unlimited admission while the Plus Annual Pass, $159 for adults, $129 for kids includes unlimited admission, parking and food and merchandise discounts. Park areas like DUPLO Village and LEGO City allow toddlers a chance to ride Lego cars and take over a mini town built for their height. LEGO Technic features the Test Track roller coaster and AQUAZONE Wave Racers where riders avoid getting wet while being zipped in and out of waves. Be amazed by the water stunt show Pirates’ Cove and tour far away places like Las Vegas and Washington, D.C. in MIniland USA. Dedicate to family fun and building block adventures there is truly something for everyone. LEGOLAND is located at 1 Legoland Way in Winter Haven. Opening day hours will be 10 a.m.-5 p.m. For more information, visit www.LEGOLAND.com. 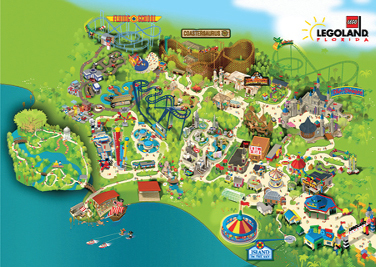 Follow LEGOLAND on Facebook at www.facebook.com/LEGOLANDFlorida.